Hi friends! 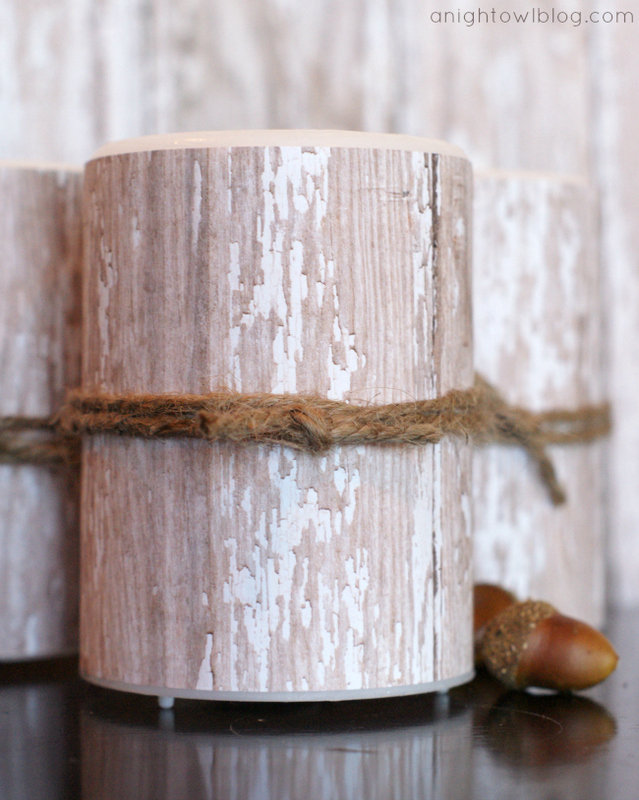 Have you seen the fabulous birch candles that are being sold by fabulous stores such as Pottery Barn and World Market lately? I’m in love with them. 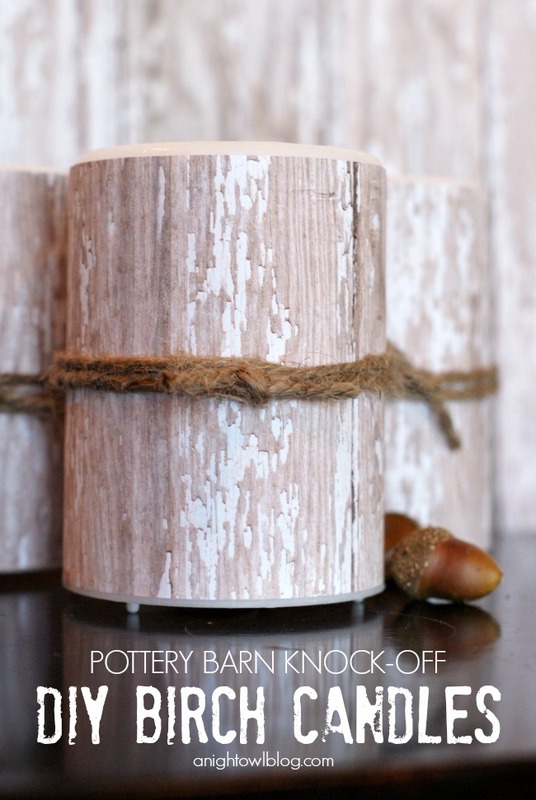 Well today I’m sharing a quick and easy tutorial on how you can make your very own Knock-Off Pottery Barn Birch Candles with LED pillars from the Dollar Tree! 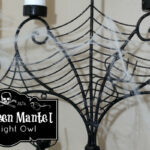 Tie a length of twine around the candle, and you’re done! Aren’t they super cute? I’m so happy with how my own version of the birch candles turned out, I’m heading back to the Dollar Tree to pick up more LEDs! And how cute would these be as a gift? I don’t know anyone who wouldn’t love to have a set. 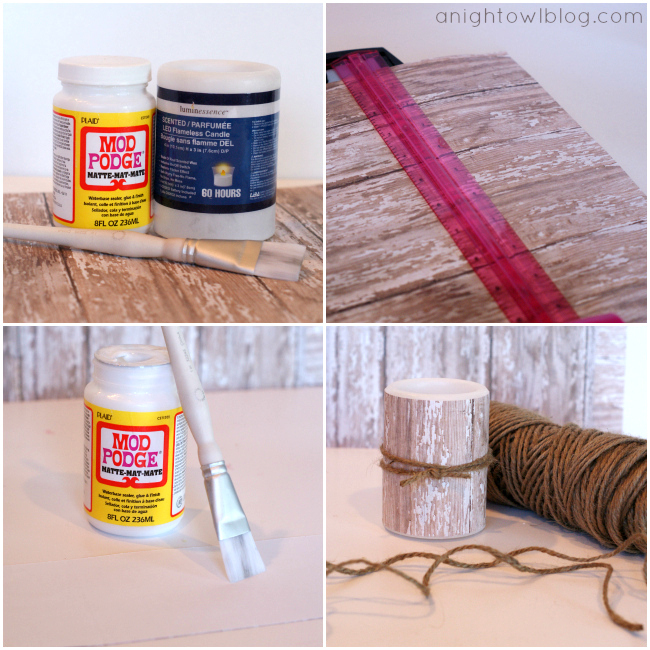 A perfect DIY for your holiday gifts or to spruce up your household this season. Oh my goodness! Way too cute! I la la love these! I love that these are flameless, because with my 16 month old and my dog, candles are not an option here! Plus, these look JUST like the real thing. 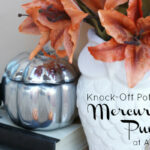 I’m pinning this– they’ll fit in perfectly when I finally get around to re-doing my room in my bird theme! Such a fantastic idea Kimberly, and they look so real! I also love the flameless part, as my four year old constantly tries to blow out any lit candles. She scares me a little. So glad you shared. I’m heading to the Dollar Store tomorrow! They look great Kimberly! I like your version so much more than the PB version. And no pesky flame! Oh!! They turned out GREAT Kimberly!!! I sooo want to try and make some!! Very very pretty!!! I love this! I need to hit up Archivers for this paper PRONTO!!! Thanks for sharing! Sweet! Those are super cute and so easy to make! Must pin this. I love these! Thank you so much for sharing! Have a great weekend! Brilliant! This is one of those fabulous gifts for “the one who has everything.” I have a couple of those on my list. WAY cute! I might have to make some. And how EASY are they? I love it! KIMBERLY! These are freakin great. Love Love Love and I am totally copying you-hope it’s ok? If you have a sec, I would love for you to share at Get Schooled Saturday at Too Much Time On My Hands. Oh my goodness – I was contemplating buying this at the christmas show yesterday but hated the price. I am definitely making this – thank you! Oh fantastic Danielle! They’re so easy to make! I wanted to let you know that I featured this in my “What I Bookmarked This Week” post – stop by and see. This is such a great project! I’m inspired to try it…thanks for sharing! such a great idea Kimberly! SOOO easy and looks fabulous! What a cute idea! Great for gifts, good timing on the post. I’ve pinned and will be trying this in the future! I love them! I may have to do this! Can you tell me what brand of paper you used? I can’t find birch craft paper. Hi Tricia – I believe it’s The Paper Studio. Thanks Jane! Good luck at Dollar Tree! I’ll keep my fingers crossed for you! Thank-you so much!! I had just decided to make a center piece for my table out of a wreath and some deer antlers, and I wanted to put birch candles in the middle. But didn’t really want to buy them (costly) I thought of getting the sheets of birch and wrapping candles with them. I found LED candles at a store for 9.99 and thought about those too. But this is soooo much better and cheaper!!! You’re a life saver. These are wonderful! I love the dollar store so very much, pinning! 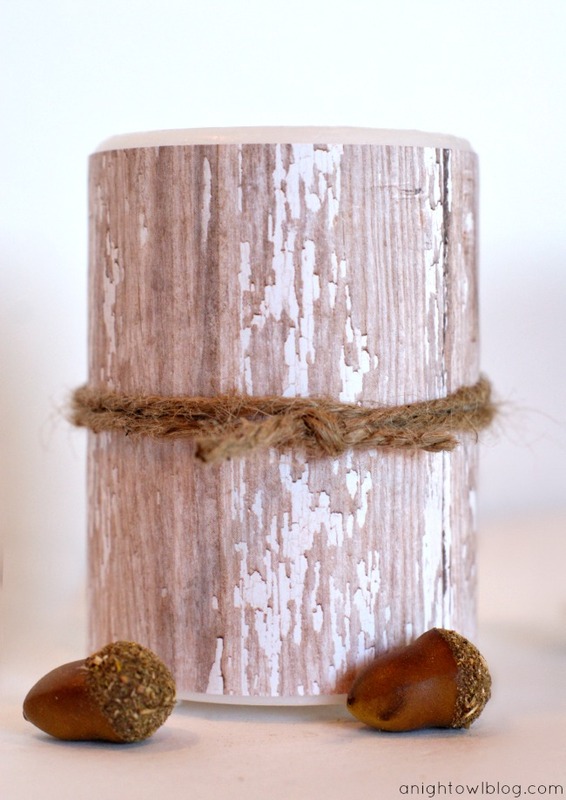 I love your candles and I’m loving the “birch” trend going on right now too! 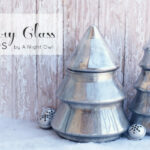 I have these linked to my DIY candles post as well today, thanks! I tried this and it turned out so cute. Super easy. Thanks for the great idea. I posted to pinterest for others to share and do! Oh fantastic Beth! You should post a picture of your version on our Facebook page! I did this too, and it turned out just like your picture, so I didn’t take a pic of mine, because I’m not a very good photographer –LOL! Anyway, that never happens to me –something turning out just like it’s ‘sposed to, so thank you so much for that!!!! This is way cool and way elegant and way cheap! Thanks awesome Val! Thanks for sharing!! I just made a bunch of these with different paper for Christmas gifts. Thanks for the great idea! These turned out great. 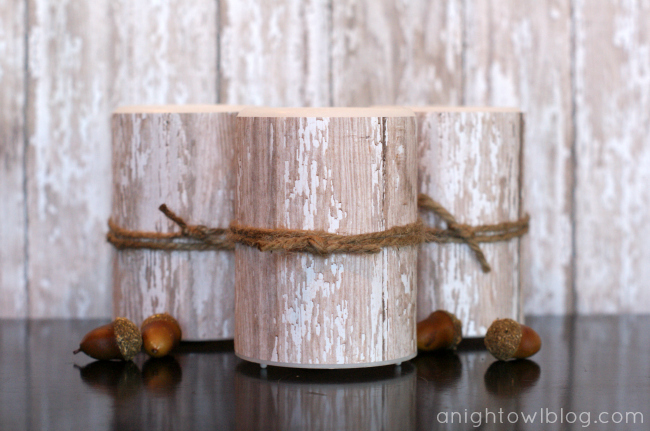 I love the birch look candles too and have been trying to decide how I could make some similar candles. The scrapbook paper looks perfect, I am off to search my scrapbook paper stash in the hope I can make something similar. I still may go out and find myself a piece of wood and get the drill out to insert a tea candle into a piece of birch too. 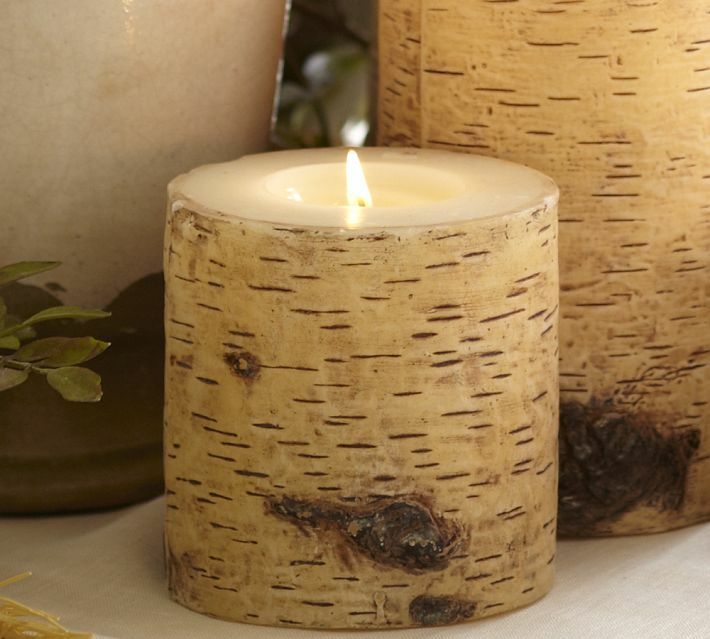 Another fairly cheap option for these beautiful candles are to actually use sheets of birch, they are sold on save-on-crafts.com you can get 3 sheets of birch 15inches x 6.75 inches for only 6.99! Great idea! They turned out great!